So the old man set off to the forest and began to hack and to hew with such a will that he soon had quite a large bundle, and with every stick he cut he seemed to smell the savoury khichrî and think of the feast that was coming. Just then a bear came swinging by, with its great black nose tilted in the air, and its little keen eyes peering about; for bears, though good enough fellows on the whole, are just dreadfully inquisitive. At this the bear’s mouth began to water, for, like all bears, he was a dreadful glutton. “Do you think your wife would give me some too, if I brought her a bundle of wood?” he asked anxiously. “Perhaps; if it was a very big load,” answered the woodman craftily. “Would—would four hundredweight be enough?” asked the bear. “Say half a ton, and it’s a bargain!” quoth the woodman. “Half a ton is a large quantity!” sighed the bear. “There is saffron in the khichrî,” remarked the woodman casually. 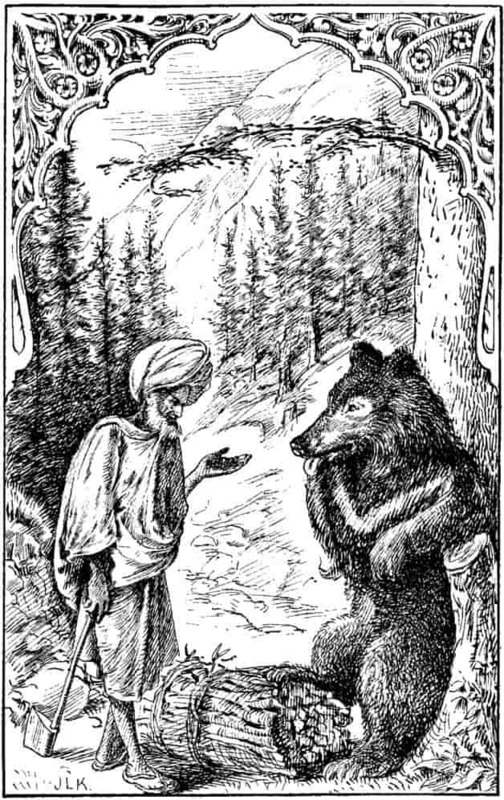 “The bear licked his lips, and his little eyes twinkled with greed and delight.” Illustration by J. Lockwood Kipling, published in Tales of the Punjab by Flora Annie Steele (1894), MacMillan and Company. The bear licked his lips, and his little eyes twinkled with greed and delight. Away went the woodman in great glee to tell his wife how the bear had agreed to bring half a ton of wood in return for a share of the khichrî. On this the woodman became quite pale. 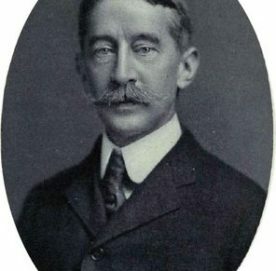 “In that case,” he said, “we had better begin now, and have a fair start.” So without more ado they squatted down on the floor, with the brass pot full of khichrî between them, and began to eat as fast as they could. “Remember to leave some for the bear, wife,” said the woodman, speaking with his mouth crammed full. “Certainly, certainly,” she replied, helping herself to another handful. “Certainly, certainly, my love!” returned the old man, taking another mouthful. So it went on, till there was not a single grain left in the pot. So they made haste to lock up all the food and hide themselves in the garret. Meanwhile the bear had been toiling and moiling away at his bundle of wood, which took him much longer to collect than he expected; however, at last he arrived quite exhausted at the woodcutter’s cottage. Seeing the brass khichrî pot by the fire, he threw down his load and went in. And then—mercy! wasn’t he angry when he found nothing in it—not even a grain of rice, nor a tiny wee bit of pulse, but only a smell that was so uncommonly nice that he actually cried with rage and disappointment. He flew into the most dreadful temper, but though he turned the house topsy-turvy, he could not find a morsel of food. Finally, he declared he would take the wood away again, but, as the crafty old woman had imagined, when he came to the task, he did not care, even for the sake of revenge, to carry so heavy a burden. Now, as he left the cottage, he caught sight of the beautiful golden pears hanging over into the yard. His mouth began to water at once, for he was desperately hungry, and the pears were the first of the season; in a trice he was on the wall, up the tree, and, gathering the biggest and ripest one he could find, was just putting it into his mouth, when a thought struck him. So saying, he began to gather the ripe pears as fast as he could and put them into the khichrî pot, but whenever he came to an unripe one he would shake his head and say, “No one would buy that, yet it is a pity to waste it” So he would pop it into his mouth and eat it, making wry faces if it was very sour. The bear, thinking some one had fired a gun at him, dropped the khichrî pot into the cottage yard, and fled into the forest as fast as his legs would carry him. So the woodman and his wife got the khichrî, the wood, and the coveted pears, but the poor bear got nothing but a very bad stomach-ache from eating unripe fruit.